Question: when is a hi-fi separates component not separate? 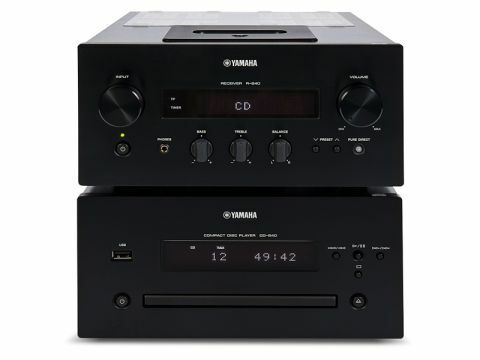 When it's not functional apart from its sibling – which makes the R-840 amplifier a separate but the CD player not. The latter has its own power supply and mains lead but simply refuses to power up when not connected to the amp via the supplied data lead. The amp will work, but isn't so attractive on its own with effectively just the one line input, plus of course digital and analogue radio and the iPod dock. Linked up, the two units form a pretty well-specified system. The CD player carries a USB input for memory sticks etc, and apart from a front-mounted input or a digital input there's not much more one would wish for. Operation is fully traditional, right down to the single-turn volume control, though in the manner of other current Yamaha components the volume knob operates an encoder which controls gain electronically. Tone controls are defeatable by the 'Pure Direct' button which also kills the display. Assembly inside both units is more budget-looking than the other units here, with plenty of loose wiring and cheap circuit board material. You do get a lot of components for the money, though – none of them audiophile-grade but decent enough. It's all linear stuff, with conventional mains transformers (frame-type) and a regular linear output stage on an internal heatsink. The price includes speakers – they're not bad, but a bit congested. Although the sound ticks most of the obvious boxes, it seldom seems to gel in an entirely satisfactory manner, our listeners felt. Detail's a little shy in complex music, while simpler tracks suffer from a slightly shut-in perspective and some mild coloration in the upper midrange that makes bright instruments and voices a little coarse. On the other hand, this system does at least present quite 'together' music-making – there's no feeling of disjointed parts within an ensemble, so one isn't made too aware of the shortcomings. Bass is decent, with good extension and a reasonable degree of attack, though it's not always the most tuneful and one of our listeners pointed out that it can be a bit of a dead 'whack' at times when it ought to be a specific note. High treble is a little shut in but no more than one expects from budget kit, and not markedly more so than the other sub-£1,000 systems. The FM radio seems slightly coarser than most of the others, but DAB and iPod are fine.